A stylish addition to your home. Along with Single Skin Sectionals we also have 42mm Insulated Sectionals available. These provide a thermal and acoustic barrier helping you control energy bills and reduce noise. Available in a flush design or a more traditional Georgian style panel. Range of colours to choose from including Golden Oak and Rosewood. Sectional Doors can also be supplied with Electric Openers allowing your door to be operated with one simple click of a hand held remote. Contact Us to enquire about our sectional doors or to arrange a free site survey. 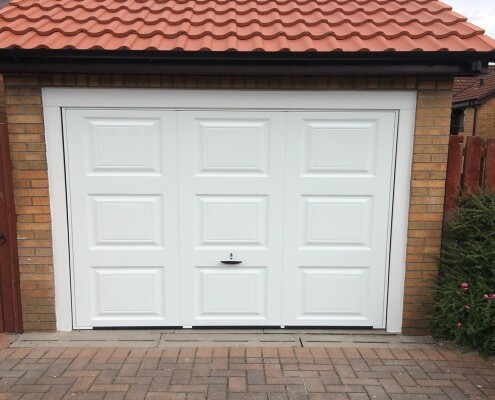 Fill in your details below for a free quotation for a Sectional Garage Door.